Gorgeous pale blue green Chrysocolla with green Malachite polished stone from Kolwezi, Katanga, Democratic Republic of the Congo, Africa. This combination of minerals symbolizes wholeness and peace. Chrysocolla is a tranquil and sustaining stone, calming, releases negative attachments, cleanses and re-energizes all the chakras and aligns them with divine love. Chrysocolla is about cool flowing conversation. Channeling a state of grace when speaking your honesty. Chrysocolla faciliates communication with the inner self - honesty in emotions, feelings, and thoughts. What is your heart truth? Once you figure that out - all expressions of love come forth to match your vibration :) It is also an excellent stone for women as it resonates with feminine energies, the female sexual organs and is useful for alleviating menstrual cramps and PMS. Chrysocolla opens psychic vision and assists in meditation and communication. Malachite is a stone of encouragement, risk-taking and change. 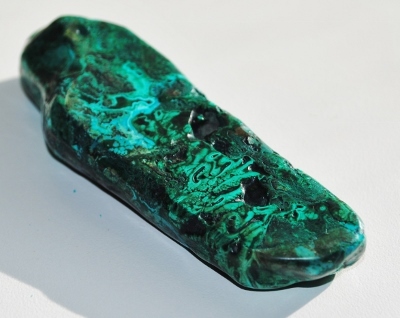 Malachite draws out deep feelings and psychosomatic causes. Malachite breaks unwanted ties and outworn pattern. Malachite is a protective stone, believed to be still evolving and will be one of the most important healing stones of the new millennium. 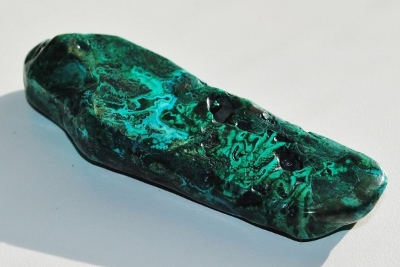 Malachite amplifies both positive and negative energies, grounds spiritual energies, clears electromagnetic pollution and heals earth energies and strong affinity with nature and devic forces. When placed on the Third Eye, it activates visualization and psychic vision. Malachite brings balance and harmony that opens the heart for unconditional love.